The proposed tour is a visit of Acadian sites, lookoff sites, and special sites illustrating the giant tides of Kings county, Nova Scotia. This is the pre 1755 ancestral Acadian land of the St-Charles-des-Mines and St-Joseph-de-la-Rivière-aux-Canards parishes where Acadian settlements stood on the shore of the tidal rivers Gaspereau, St-Antoine (Cornwallis), Canards, Habitant and Pereau. Although it is possible to briefly see all these sites in one long day it makes more sense to take a few days to appreciate them fully. After all the British took nearly 4 months to deport those ancestors to the colonies. Some of the latter walked back thousands of kilometers hoping to regain their lost paradise. Don't leave without knowing why. A basic knowledge of the giant Fundy bay tides (14-16 meters) will help understand the Acadian struggle and way of life exploiting the salted marshes. Any tidal site should be visited and revisited at low and high tide. Get the tide chart for this area ( http://www.glinx.com/~sherm/Tides/tide_charts.htm ) and a detailed Kings Co. road map. Kings Co. being at the 45th parallel it is the best place to observe stars. If you are interested in astronomy bring those map too. 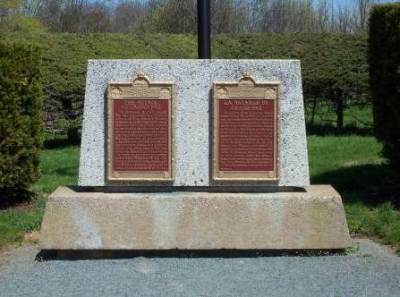 1682- Pierre Melanson and Marguerite Mius D'Entremont are the first to settle in Grand-Pré. 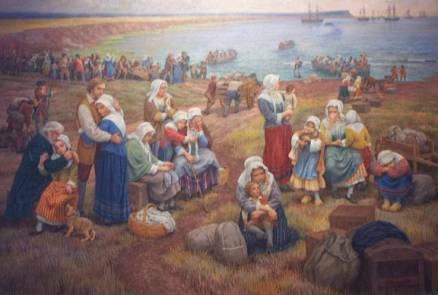 They are soon joined with a growing number of Acadians leaving the over populated fields of Port-Royal. It was by dyking the marshes of the rivers Pereau, Old Habitation, Canard, St-Antoine and Gaspereau that our ancestors could farm successfully. 1755-Caught between the rival power of France and England they are deported to the British colonies. 1847- Henry W. Longfellow publishes the poem Evangeline. This popular literature will create the urge for American tourists to visit Grand-Pré. 1907- John Frederic Herbin, an Acadian descendant living in this area, acquires the land where once stood the church of St-Charles-des-Mines. 1908- The Nova Scotia government declares this land an "Historic Site". 1917- Dominion Atlantic Railways buys the land that has become a tourist railway station. 1920- The DAR erects the Evangeline Statue. 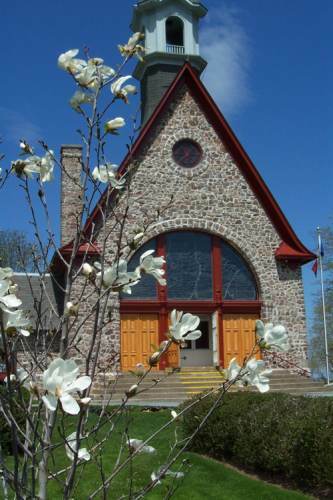 1922- Part of the land is given to Société de L'Assomption, an Acadian insurance mutual which starts the construction of a memorial church. 1924- The deportation cross is erected on the side of the railway where the embarkation is believed to have taken place. 1930- The memorial church is completed inside out and is inaugurated as a museum. 1957- The government of Canada buys the park. 1961- The Grand-Pré National Historic Site of Canada is proclaimed. 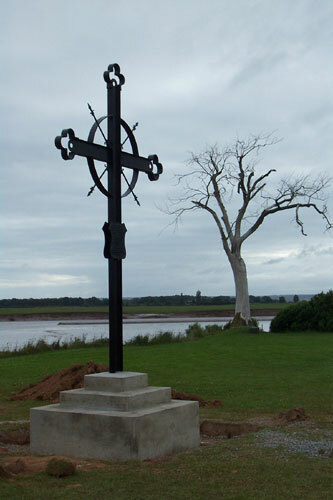 2004- Some of the most important Congrès Mondial Acadien events took place at this site. The Grand-Pré National Historic Site of Canada greets the visitors at its interpretive center. After studying the center visitors are directed either to the 16 acre garden of the memorial church or to the activities field. The kiosk in the atrium of the new center informs and guides the visitors. The three main public rooms are an exhibits hall, a multimedia theater and a gift shop. In the exhibits hall, many audiovisual displays, huge scale models, cross cuts of dykes and dykelands, illustrate the daily life of the Acadian people. The multimedia theater has the shape of the hull of a boat. Six lateral screens modify the decor while the three front screens inform of the 1755 events. Two of the front screen give a voice to the British, French, Acadian and Mi'kmaq representative while the main screen depicts the deportation. The audience kind of relive those events and after the 22 minutes showing you rarely see dry eyes leaving this room. The gift shop offers history, genealogy, armories books. It also sells souvenirs such as flags, Acadian crafts and postcards. The garden show 14 acres of plants, shrubs, flowers, orchard, century old willows, a kitchen garden and duck ponds. 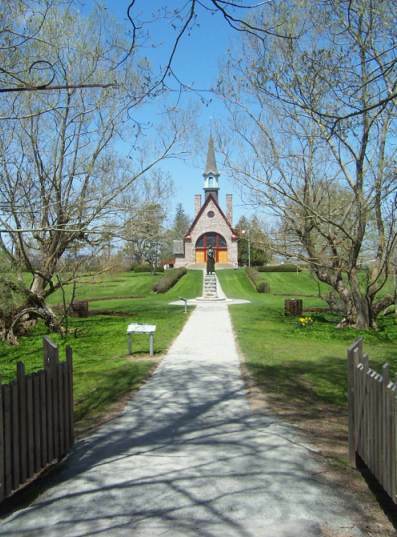 A walking path brings you to the Evangeline statue, the memorial church, the blacksmith shop, the ancient Acadian well, the Herbin commemorative cross, etc.. In the church, the stained glass, like a solar clock, projects a red line tearing the deportation plaque in half. In the nave of the church we see a presentation of the deportation history through arts. The six descriptive paintings signed Claude Picard are the main works of art. In the choir of the church there is an audiovisual presentation where two Acadian children tell in their own words what happened to them in 1755. At the blacksmith shop don't miss the strange "snowshoes" used by oxen and horses when they were working on the muddy marsh land. On special days, the activities field becomes a village of marquees, tents, kiosks and platforms and stages accommodating family reunions, artist shows, colloquies. The access fee vary depending on the size of the group. (Individuals, tour buses, schools). Ask for the special rate for children and seniors. Season passes are available for one Historical site, for all Historical sites of Canada and all Park Canada sites. Locals can get an ambassador card when they guide their own visitors to the center. Leaving the Grand-Pré interpretive center turn left (north) and cross the railway. You are now below the sea water level (at high tide). This road to Long Island travels for 2 km on a 4 km wide dykeland protected from the sea by Acadian dykes. Two kilometers to the west or to the east dykes restrain the sea water. This the most spectacular salt marsh recuperated from the sea. Later on this guided tour you will get closer to some of those dykes. Once you have reached Long Island turn left at the intersection. The road will soon turn right (inland) and bring you to the north shore of Evangeline beach where there is a public parking lot. At very low tide, the beach becomes an immense mud flat nearly 5 km long. More mud flats are created farther into the sea as the tide get even lower. On the horizon, Blomindon cliff stands guard at the entrance to the Minas basin. That certainly illustrates why many navigators did not appreciate this basin where they could get stuck in the mud for half a day. That might also explain why in the 17-18th centuries, visits by authorities (either British or French) were scarce, making Acadians more independent towards their instructions. After a fresh air pause at Evangeline beach, go back towards Grand-Pré. Cross again the great meadow and at the next intersection after the interpretive center, turn right on Old Post road. 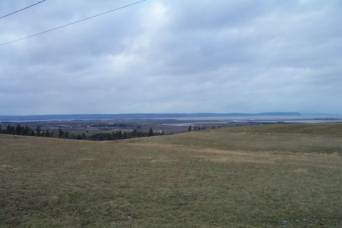 Stop on the top of the next hill (Mitchell Hill) and admire the view of the Grand-Pré National Historic Site, the great meadow, Long island, the sea on left, the sea on the right and the sea far behind. 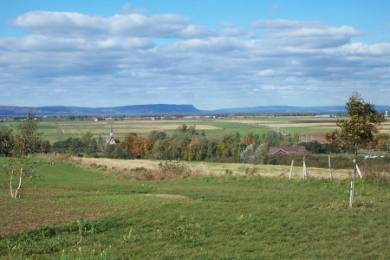 Our ancestors had settled right here on those highlands between today's Horton and Wolfville. A 1950 aerial photographic survey shows about 28 cellars in this area. At least seven more cellars were visible in Long Island. The Acadian house did not have a second floor but had a meter high stone cellar. Although those cellars and field borders of the past are no longer visible, certain trees and shrubs (like French willows, Lombardy Poplar, Black Cherry, Beaked Hazelnut, Chokecherry, English Oak, Daphne, Motherwort, Sweet Brier, Bouncing Bet, Red Fly Honeysuckle, Hyssop, Wormwood, Chicory, Slender Vetch, Caraway, Hops and Tansy) brought by Acadians have survived to indicate their homesteads. The 1701 and 1714 census show that the following families were living here:Dugas, LeBlanc, Terriot, Longuespée, Rimbaud, Labauve, Babin, Doucet, Richard, Granger, Vincent, D'Aroy, Bugeauld, Melanson, Douaron, Brasseux, Mouton, Landry, Perrine, Jassemin, Gautereau, Blanchard, Aucoin, Thibodeau, Bourc, Hébert. Continue on this road for 3.4 km to reach Wolfville (The Old Post road joins route # 1). If you are from Québec, let me remind you that in Nova Scotia the pedestrian has the right of way which means crossing a university town such as Wolfville implies numerous stops. Entering Wolfville, turn right to the parking lot just before the first gas station, Petro-Canada. 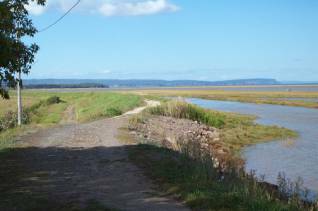 From there you have access to the small sea port and interpretive park of Wolfville. There you will learn about the busy port activities of the past and the great tides. This port is the beginning of two dykes. One, 3 km long, protects the west side of Grand-Pré. The other, 4 km long to Port Williams, protects the marshes on the Cornwallis river shore. The paths on those dykes are well frequented, on foot or bicycle, by the local population, the university students and the Long Island Evangeline beach summer campers. To walk on these dykes where marsh grass sods were trampled and stamped by your ancestors might create intense emotions. You could also approach this port and park by turning right after the Tim Horton coffee shop but the parking lot is rather small. The rectangle formed by Front, Elm, Main and Harbour Side streets delimits the downtown area. Walking this rectangle would be a very good idea as it hosts plenty of banks, unique boutiques, shops of all kinds and local restaurants. Wolfville and Ste-Anne-de-Belle-Vue (Québec) are officially twin cities. Visitors to both cities tell of the noticeable similarities in appearance.. If you need medical help there are two "Drop in" medical clinics in Wolfville. The Mud Creek Medical Clinic is right downtown on Elm street across the parking lot of the old train station. From Wolfville drive westerly on route # 1 (Main street) towards Greenwich and New Minas. On this road many farm markets offer their fresh and varied home products. 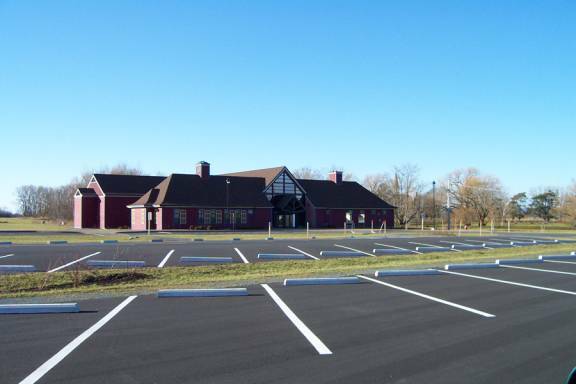 The Henniger market is one that has a rest stop offering children an animal petting farm and a walking trail. The detour on highway 101 bypasses between exits 11 and 12 a very busy area of shopping centers, car dealers, fast food restaurants etc.. Although New Minas was an important Acadian settlement since 1720 there are very few visible traces. The Acadian hamlet was situated between Jones and Cornwallis streets, close to the railway. At exit 13 of Highway 101, turn right towards route 359 and Kentville. At the bottom of the Kentville hill turn left on route 1. Stay in the middle lane as the right lane forces you to exit at the liquor store parking lot. Staying in the middle lane you will then have no choice but to turn right on Cornwallis street..
Kentville was inhabited by some Acadian families in 1755. There was a mill on the brook at the eastern extremities of the town. 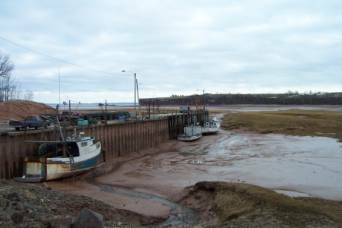 The tide goes up the Cornwallis river to the center of the town. Kentville is the Shiretown of Kings county. It hosts the regional hospital (with emergency center). Notice on Cornwallis Street (route 359) the Kings County Museum. This museum shows many Acadian and New England planter artifacts, showcases etc... Their research center has many Acadian records on microfilms and CD-ROM's (also for sale). A visit is strongly suggested. From Kentville, follow route 359 towards Hall's Harbour. Drive about 18 km. On your way, notice the Canard river bridge. It is the location where one of the first Acadian dykes was erected . The giant tide flooded the Canard river up to those marshes west of route 359. Approaching the Bay of Fundy you will notice Cape Split. From route 359, the crack giving the name to this cape is quite visible. Lower your speed while driving down the last hill before the sea. Fundy bay water is very cold, rarely above 10° C. In the background you will see Cape D'Or and Cape Chignecto. Farther left, behind the Isle Haute is the shore of New Brunswick. 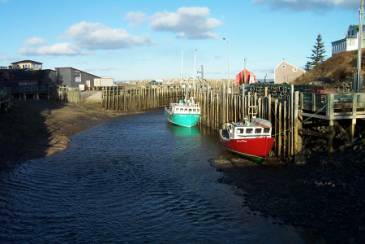 Hall's Harbour is a typical picturesque fishing port. Visiting the wharf at very low tide and again at very high tide show the spectacular effect of the giant tides. At low tide the port is merely a stream and at high tide the wharf accommodates a dozen fishing boats. There is a lobster pond and country restaurant. There are many hiking trails. A surprising large number of art galleries and studios have set up shop in this small community. Leaving Hall's Harbour, drive 5.2 km back on route 359. Then turn left on Gospel road towards the Lookoff and Scotts Bay. From route 359 drive 6.3 km Farms on the plateau of the North range are mostly abandoned because the shallow soil cannot accommodate modern farm machinery. At the intersection of Baxter Harbour drive straight ahead on Gospel road towards Lookoff and Scotts bay. Driving 6.5 km further you join the route 358. Turn lightly to your left and drive 1 km towards the Lookoff. A parking space is awaiting you at the top of the 200 meter high cliff above the valley. There you will see from above the Acadian paradise that story tellers, poets and singers so often have described. 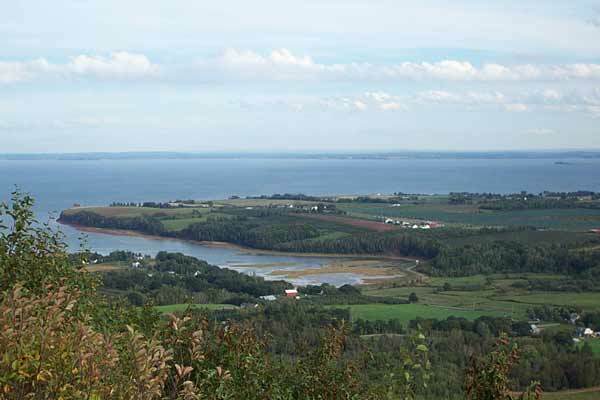 You can see the Pereau, Habitant, Canard and Cornwallis river that were settled by Acadians. Right down below to your left you see the Delhaven cove at the mouth of Pereau river. In the background notice Long island and Grand-Pré behind it. The student residence of Acadia university stands out marking the town of Wolfville. The colors of this view keep changing depending of the agricultural stage of growth and the level of the tide. From the Lookoff drive 15.4 km; 12.8 km on the 358 and 2.6 km on Cape Split road. This bay has a particularly nice panoramic view. This is the place to watch a superb sunset. The beach is well known for its precious rocks (Agates, Amethyst, etc..) Centuries ago the stones of this bay were used by the Mi'kmaw people to make arrow heads. Swimmers say that the bay water is warm (Read less cold than the open sea). Scotts Bay is a small fishing port also affected by the giant tides. But what makes this bay so popular is the hiking trail to Cape split. This path (13 km return) offers a half a day walk on the cliff tops to see spectacular panoramas so wide that no camera can capture. At the tidal bore time the noise made by the rushing water is overwhelming. Leaving the Cape Split path, drive back 11.9 km (on the 358). Turn left on the Stewart Mountain road. This is a small short cut on a well maintained gravel road. After driving 3 km on this road you reach the Blomindon intersection. Now you will have to decide. If you turn left the road ends at the Blomidon provincial park. This park is well known for its look out views, camping, hiking, beach combing, picnicking. (No fee for a day visit). Cornerstones of possibly an early Acadian house are present along the Border Brook Trail in Blomidon Park. If instead you turn right you will be going to Pereau and Canning. I suggest, whatever you decide, that first you drive straight ahead on the gravel road for another 0.7 km to the Houston beach. Houston is the local preferred beach, ideal for beach walking and swimming. This beach is unknown to tourists. Take advantage of it but keep this discovery to yourself. The beach is at the mouth of Pereau river in the Delhaven cove. At very low tide the beach extends 4 km into the ocean. If you have ancestors who lived in Pereau you could easily imagine their children playing on this shore. Just across the cove you will notice (maybe not) a tiny island. This is Paddy's Island. A few decades ago this island was large enough to be used as cows pasture. But this is where the giant tides destroy the shore up to 1 meter a year. Look for fossils and precious rocks. Tracks of an Atrepius, a small Triassic dinosaur was once discovered here. The water is warmer with the incoming tide. In summer it could reach 26°C. Leaving Houston beach turn right towards Pereau and Canning. From this intersection drive 2.7 km to see the small but picturesque fishing port of Delhaven, also visible from the Lookoff. The wharf is accessible only at high tide. Then turn left towards Medford and Kingsport. This road is another small graveled road shortcut. You will drive right on the fresh water side of the Pereau dyke. You are under the sea level at high tide. Stop and take a look . It is quite impressive. Drive again 2.1 km on this graveled road. Turn left on the Medford paved road. You will see a nice horse farm which reminds that the Acadian used horses for traveling while the working beasts were castrated oxen. The road turns right. You will see a cranberry farm and many orchards. Acadians brought seven apple species some of which are the ancestors of today's orchards. Some say that the little Bass creek was dyked but others claim that the Acadian families living in this area were fishermen. This area was first used as a camping ground by the Mi'kmaq people. After driving 5.8 km on the Medford paved road you reach Pier road of Kingsport. Turn left to take advantage of the popular Kingsport beach. Try a barefoot beach walk while eating a refreshing ice-cream cone sold right on the beach. 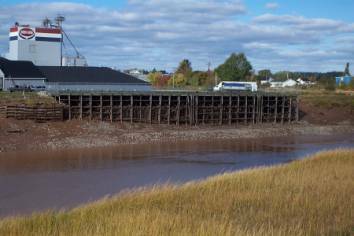 In the 19th century this was a very busy sea port as well as a point of embarkation of the Parrsboro ferry boat into the 20th century. 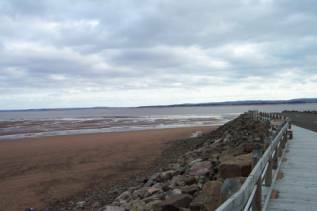 At low tide the beach extends way up to the horizon towards Wolfville. Instead of going to the beach, why not turn right towards Habitant where you might admire and perhaps taste the Habitant winery products. Drive 1.6 km on Canard street and turn left towards the Wellington dyke. This dyke protects all the up river marshlands all the way up to the Canard river bridge on route 359. By building this dyke the planters outdid the Acadian"grand" dyke (where the 358 road was built). 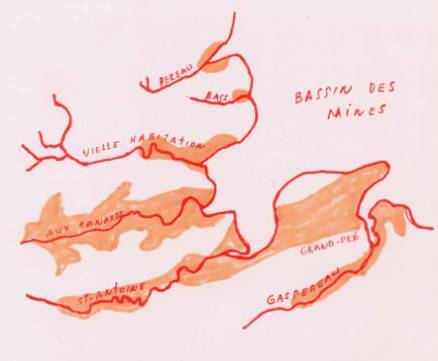 The shadowed parts on the drawing below represent the flooded marshes of Canard river before the Acadian dyking. The Canard river valley was then a huge fjord at high tide. 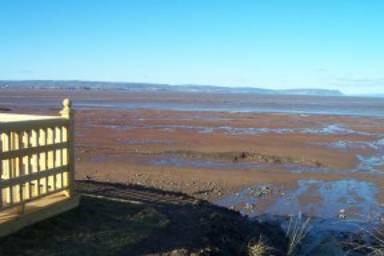 Tidal sea water from the Minas basin going up river about 10 km flooded thousands of low land acres. The Acadians reclaimed these acreage of fertile land from the sea by building dykes. Two types of dykes were used. The "running" dykes along the of the river was simply made of marshland grass sods piles as bricks. The "crossing" dykes blocking the stream of the brook or river needed to be reinforced with rocks, branches, logs and tree trunks. It also needed a sluice controlled by a valve letting fresh water out but stopping sea water from coming in. This part of the dyke was called the "aboiteau". At first with the manpower of one or two families small dykes were built on the more upstream waterways protecting the marshland of the tributary brooks. 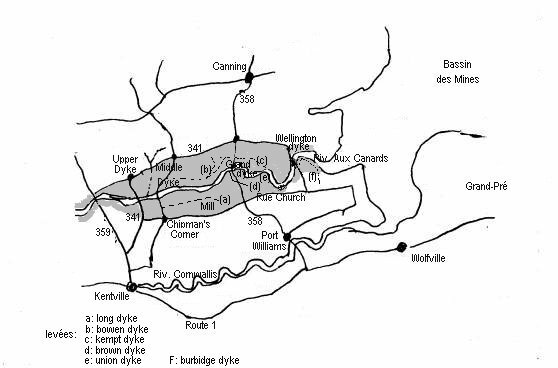 The Canard river dykes were erected gradually as the number of settling families increased. Phase 1: The very first dyke was erected on the "Sheffield" brook. This dyke reclaimed 40 acres of marshland. Soon after a small dyke was built on Canard river just upstream of the present route 359 bridge. Phase 3: Then a major cross dyke was erected at today's Middle Dyke road bridge. More running dykes protected the shore below. The planters named those Acadian dykes "Long dyke" on the south shore and "Bowen dyke" on the north shore. These works doubled the acreage of fertile land. At this point, (before phase 4) Acadian boats could sail up to the wind mill built at the eastern extremity of the "Long dyke" where grain was transformed into flour. Phase 4: Finally the Acadians built the Grand dyke crossing the Canard river near the actual route 358 bridge. The downstream Acadian running dykes were called by planters: "Brown dyke", "Union dyke" and "Kempt dyke". A carding mill was built beside this dyke. Imagine this grandiose work: Against two 12-15 meter high tides a day, hundred of workers cut sods from the muddy marsh with small spades. A few beasts (oxen) with "snowshoes" to prevent them from sucking down into the mud help carry logs and tree trunks. Running dykes and their numerous aboiteaux were built along the shore downstream. Once finished the Acadians not only had to constantly maintain and repair the dykes but they had to dig a ditch network crowning and irrigating the marshes. Three years of rain and snow were needed to removed the sea salt before yielding a substantial crop. Phase 5: The Wellington dyke erected right at the mouth of Canard river was an engineering feast realized by the Planters. After many years of work it was finally finished in 1825. This huge dyke protects the whole Canard river valley rendering all the Acadian dykes unnecessary. This construction without modern machinery is amazing. The Acadians were originally mainly from Bretagne, Poitou, LaRochelle, Saintonge all western regions of France where dykelands were used to produce salt by evaporation. Circa 1600, the French King Henri IV had also hired Holland engineers to recuperate marshland for agriculture. More specifically two master saulniers (salt makers) were hired by Razilly in 1636 (Jean Cendre and Pierre Gaborit). The Fundy bay fogs fail their attempts to produce salt by evaporation at Port Royal. But surely enough the dyke building techniques learned by early Acadians were put to use to reclaim agriculture fertile land from the sea. Reclaiming thousands of acres of marshland, the mere man power task involved was enough to built the specific characters of the Acadian people: extended cooperation and the proverbial importance of the family ties. In November 1759, the Canard river Grand dyke, not maintained since the 1755 deportation failed under a huge gale. Hundreds of acres of dykeland were flooded. In 1761, when the Planters settled on these marshlands they employed the Fort Edward Acadian prisoners to help and teach them how to repair and maintain the dykes. From the Wellington dyke drive 2.2 km and turn right (west) on Church street. (We will come back to Starr's Point later) Observe the dykelands. Drive 3 km to the route 358 intersection. This was the Grand dyke level (phase 4). Continue straight ahead on Church street. Along this road the Acadian houses were burnt by order of Col. Winslow in 1755. The Acadian cellars were still visible a century ago. Right at this place a farmer digging a barn foundation in 1923 discovered one of the numerous buried Acadian treasures. Those objets are in a showcase at Grand-Pré National Historic Interpretive center. From the route 358 intersection, after driving 3 km on Church Street you reach the Middle Dyke road (phase 3 level). It is at this intersection (a.k.a. Chipman's corner) that the St-Joseph-de-la-Rivière-aux-Canards church stood in 1755. Col. Winslow wrote in his journal that this was a magnificent church with gracious steeple and hand carved oak interior. Entering the cemetery, the first stone to your left commemorates the site of St-Joseph's church (1689-1755) and the first Planter's church (1768-1874). When the first cross dykes became useless by more recent dyking they were used as roads. The old running dykes were kept as backups and were visible until bulldozed in 1950s. The present roads north and south of the Canard river were the same ones used by Acadians. 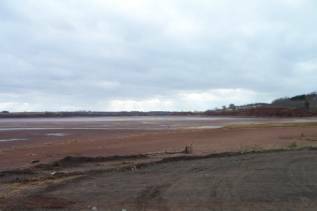 You have already seen the upstream marshes driving on the 359 between Kentville and Hall's Harbour. Drive 4 km on the Upper Dyke road (341). You are now on the north side of Canard dykeland. At least 3 mills were once at this place. The Acadian crops consisted of peas, corn, beans, cabbage, beets, onions, chives, turnips and a variety of apples. Cultivating a land that did not need fertilizer and had plenty of pasture for beef, sheep, pigs, poultry created surpluses that were exported. Drive 2.7 km on route 341 and cross straight ahead the 358 intersection and continue towards Lower Canard for another 2.2 km. Turn right on the Wellington dyke road, You have completed the loop of the Canard river Acadian settlements, considered by them as a paradise. 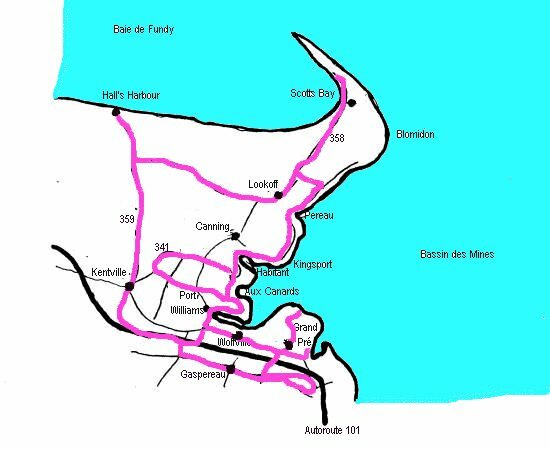 Drive ahead 2.2 km and this time turn left on Church street towards Starr's Point (La Pointe des Boudreau) in between the mouth of the Canard river and the mouth of the Cornwallis river (St-Antoine-des-Habitants river). Drive 0.5 km and turn left (do not continue on Magee street). On the shore you will notice some running dykes. Drive 1.7 km and stop at Prescott house. Charles Prescott built this Georgian style home in 1814. This museum is furnished with antiquities of the same era. From Prescott house drive 0.7 km and keep driving straight ahead at the Town Plot Loop towards the Planters Monument 0.4 km farther. The "Town Plot" was supposed by the official planners to be a town settlement for the planters but the latter chose to live right on their agriculture field. In 1755 it was an important Acadian hamlet. Stop at the Planter's monument commemorating their 1761 landing and the 1755 Acadian embarkation in 5 British sloops. 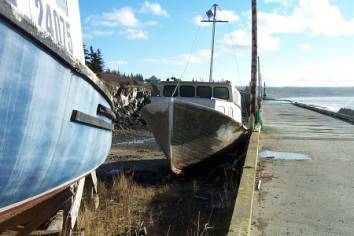 This Boudro shore on the Cornwallis river provide a slated beach making embarkation easier. The Boudro, Pinet, Comeau and Thibodeau families were living in this area. The Town Plot Loop brings you back on the Starr's Point road. Turn left and observe the sculpted eagle on a dead elm tree. The northern population of eagles comes here every winter along many other prey birds species. In January it is not unusual to see 12 or more eagles perched on the same tree. Ornithologists from all over come to visit this area. From Port Williams, drive 1.2 km towards Greenwich. Then turn right on route # 1 towards New Minas. Drive 1.8 km on route # 1 then turn left on Deep Hollow road towards White Rock. This is just before entering New Minas where on one corner is the Andy's tire garage and across an abandoned school. This winding road is a natural pass through the South Mountain range joining the Gaspereau valley. Indeed it is the ancient bed of the Black river. The Gaspereau river had eroded the mountain so far to the west that it captured the Black river. Slow down, winding road? I meant tortuous. Turn off the air conditioner and open the windows to smell the fresh natural aroma of a vegetation that has little or no sun. Drive carefully 3.4 km and at the White Rock intersection turn left towards Gaspereau. Drive 4.8 km down this spectacular valley and turn right towards the Gasperau river bridge. High tide reaches this bridge. Driving 3 km downstream you will see some running dykes on the north shore. The 1701 and 1714 census returns tell us that Gauterau, Dupuis and Hébert families were settled in this area. They operated a mill at about every Gaspereau river tributary from the South Mountain. At the intersection of the Melanson hamlet, named in commemoration of the first Acadian settling here, drive straight ahead towards Avonport. 1.5 km farther, at the next intersection, (Grand-Pre road) drive straight ahead towards Avonport. As soon as you see the Minas basin, stop. Admire from another point of view the Acadian ancestral paradise: Cape Blomindon, Grand Pré, Long Island, Boot Island. In the past those two made only one long island. A couple centuries ago erosion separated them into two islands. Because of this erosion Boot Island will likely disappear in this century. At 2.6 km from the small corner Baptist church turn left on Oak Island and right away stop at the West Brooklyn Scenic Park. Notice the 101 highway just by. Locals driving back from the capital, seeing this panorama exclaim "Home at last". Leaving the West Brooklyn Scenic Park, turn right and drive 2.1 km down the mountain. Do not take the 101 overpass. Continue 4 km on the Gapereau river road and turn right on the Grand-Pre road. Acadians were no scholars but were very ingenious. They built here a "submersible" bridge. Submerged at high tide, this bridge was used to cross the Gaspereau river at low tide. Drive 2.1 km on the Grand-Pré road. Cross straight ahead the route #1 and turn right on Old Post road. 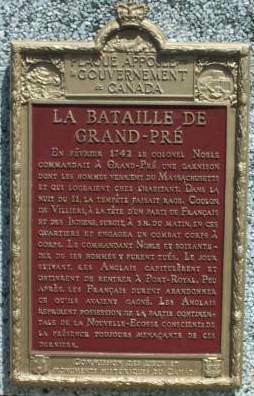 There is the Grand-Pré battle commemorative park at the corner. Drive 1.1 km on Old Post road and turn left on Horton Cross road. At the next stop turn left on Warf Road. At the end of this road you will see Horton landing, a small monument park hosting the Acadian Deportation Cross and the Planters cairn. It is in this bay that the Acadians were embarked in 1755 and where the Planters landed in 1761. Having Claude Picard painting in mind (paintings exposed at the Grand-Pré memorial church) you could visualize the historic embarkation. To conclude this tour I suggest you go back to the Grand-Pré interpretive center. (The sticker given when you paid is valid all day) Now with a bit more expertise after this tour the exhibits will reveal more information. Chat with the interpreter guides, they are eager to give much more information. Before leaving definitively this ancestral land it might be a good idea to walk again the garden, silently recollecting this human tragedy. In war situation, it is always the civil population who pay the price.